I love the holidays because it allows me to make personalized gifts for friends and family, right down to my color choices. 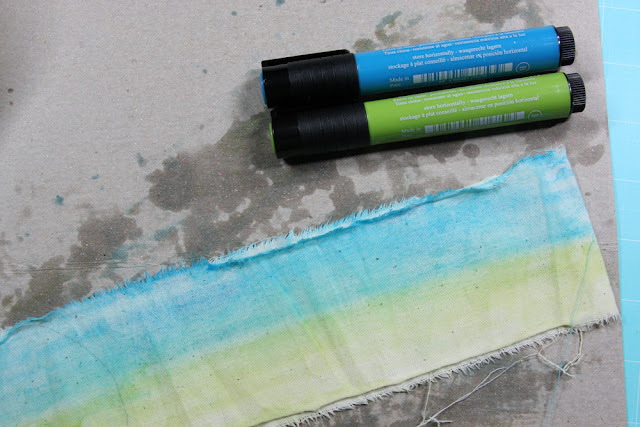 I am always on the look out for color mediums that don't bleed, are permanent when dry. Thankfully, India ink is like that! 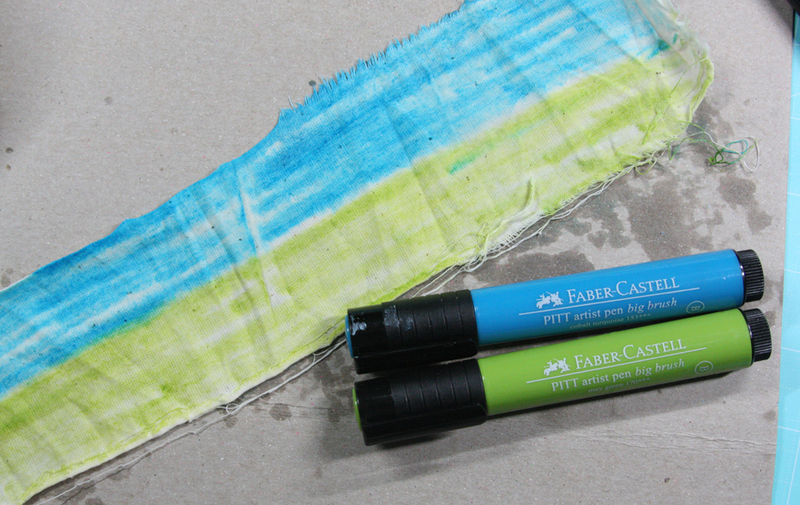 And that is the ink found in Faber-Castell Design Memory Craft® Stamper’s Big Brush Pens! In today's project, I used three Stamper’s Big Brush Pens (Cobalt Turquoise #153, May Green #170, and Dark Naples #184). You can see from the pictures that these pens also allow for great depth of color, all the way to the very lightest shade. With red, you will get a rich deep red, and a really light pink. With blue, you'll get deep ocean blue, to baby blue. How do you do this? Add water while it's still wet. Simple. Easy. Effective. Cut strip of muslin 2 feet by 4 inches. Wet under water, squeeze dry. Lay out flat onto cardboard box or similar, and use the Stamper’s Big Brush Pens Cobalt Turquoise #153 and May Green #170 to color 1 foot of the muslin as shown. Fold in half. 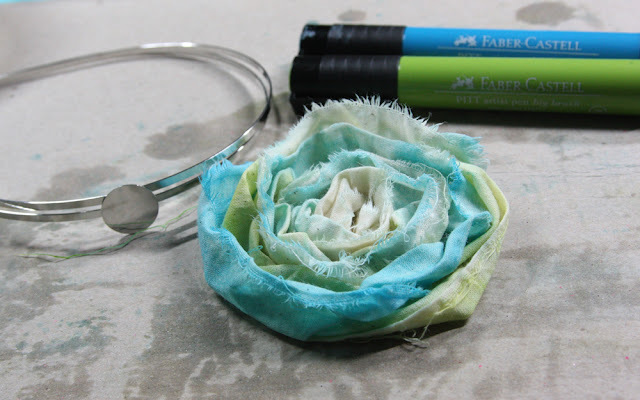 As you fold the muslin over, use your hands to rub the color into the rest of the muslin, the dampness of the fabric will help transfer color to the remaining foot and will blend the streaks together. Unfold fabric and fold in half horizontally. Start rolling it up into a swirl. Let dry. Dip fabric into 1/2 water, 1/2 glue solution. Squeeze excess and lay on craft mat to fully dry. This will make it stiff. 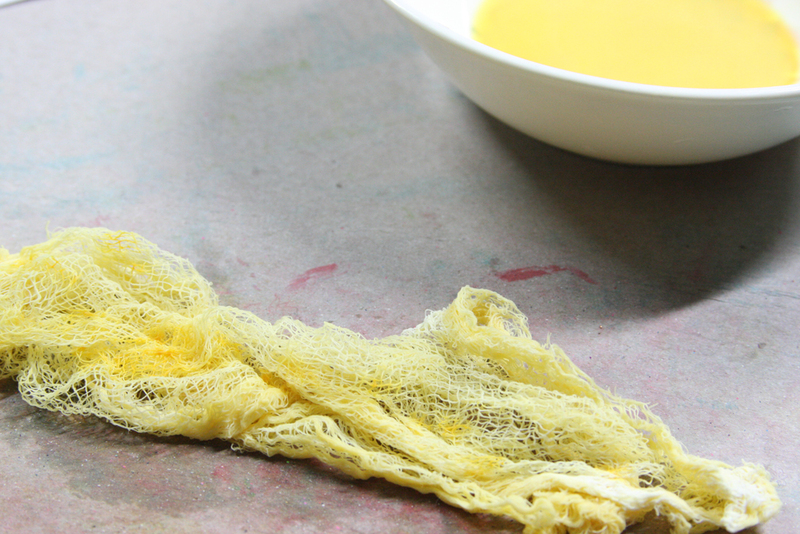 Take some cheesecloth and run it under water, squeeze out water, leaving it damp. 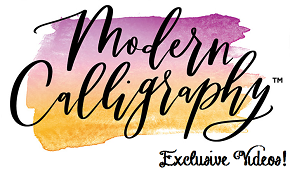 Apply the Stamper’s Big Brush Pen Dark Naples #184 to the top of the cheesecloth, and work in the color with your fingers. 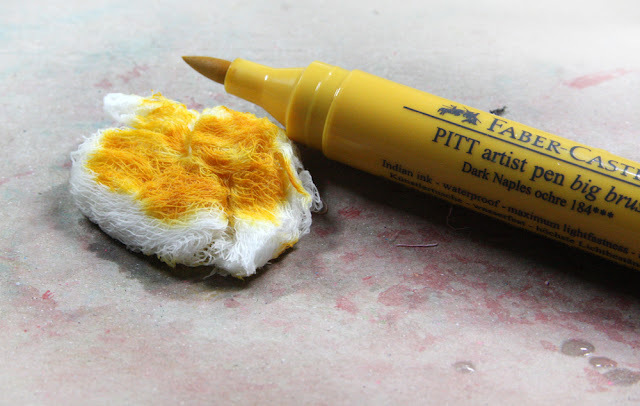 When you have achieved your desired color, dip into 1/2 water, 1/2 glue solution. Squeeze excess and lay on craft mat to fully dry. Again, this will help stiffen the cheesecloth. 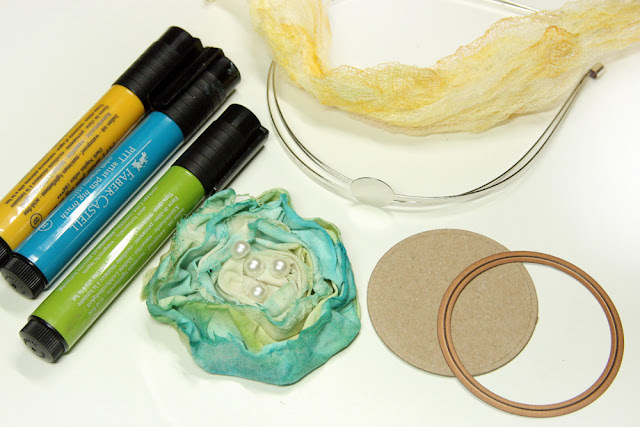 Assemble the hair band by die cutting a circle from chipboard, and hot gluing it to the flower. Hot glue pearls in place. Hot glue the cheesecloth underneath and surrounding the flower and hot glue whole piece to silver hair band. Lesley is an active designer in the craft industry, working with manufacturers and product designers to help showcase their innovative and creative products. 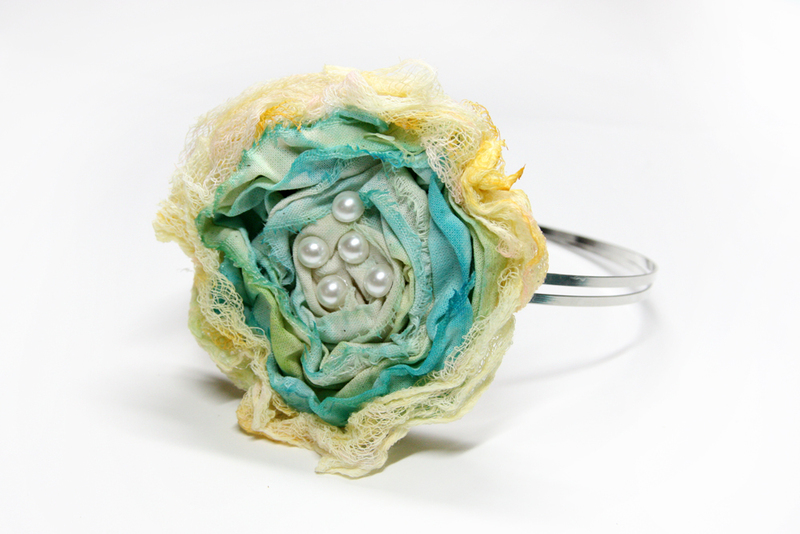 Lesley creates paper arts, jewelry, and mixed media and has had over 100 projects published in print magazines. In spring 2012, Lesley and her husband opened a Bed & Breakfast called the Arts and Crafts House, which caters to scrapbookers and crafters in Brantford, Ontario. For more information, visit Lesley's blog. So cute! I know a couple little girls that would love this!